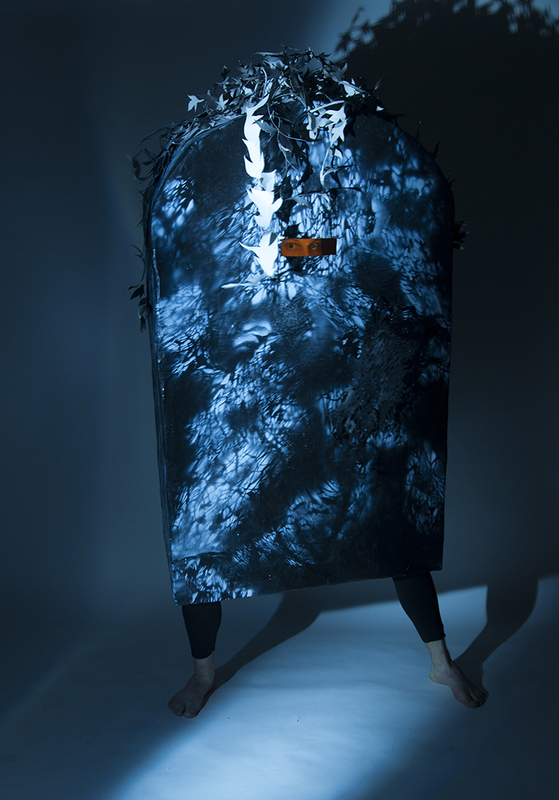 Since graduating in 2016, Antonius has been fortunate to receive fellowships from the Vermont Studio Center, Kala Art Institute, Tulsa Artists Fellowship, Halcyon Arts Lab, Houston Center for Contemporary Craft, and Yaddo. Thanks to these opportunities, they have greatly expanded their practice beyond just hand-cut paper techniques. 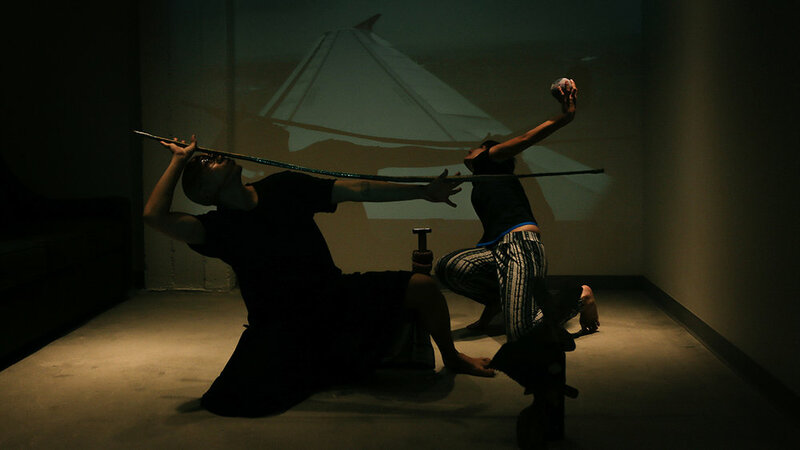 They are currently interested in complicating Vietnamese history and queerness through performance, textiles, and photography. 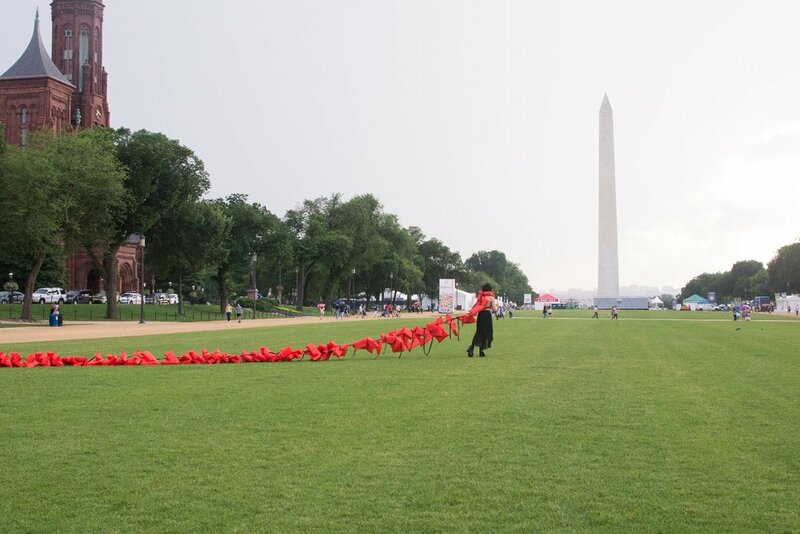 Antonius has exhibited at various institutional, private, public, and underground venues, including the Vietnam Veterans Memorial, Corcoran Gallery of Art, Hillyer Art Space, Lawndale Art Center, Living Arts, 108 Contemporary, Artscape, the Philbrook Museum, Experimental Action 2019, and the Museum of Human Achievement. Amanda Quinn Olivar (AQO): Let's talk about your subject matter... How is your story represented in your work? Antonius-Tín Bui (ATB): As a queer, gender-nonbinary, Vietnamese-American artist, I rarely ever see myself reflected in history and cultural institutions. My work demands to take up space in a still predominantly white, heterosexual, cisgender art world. I simply create objects, performances, and spaces that reflect how I navigate this dimension. Azza, 2017, hand-cut paper, approx. 78"x78"
AQO: Why do you make art? ATB: I still find myself waking up every morning with more questions and doubts than answers. Art has been a vehicle for me to connect with my multifaceted identities in meaningful ways. It has allowed me to collaborate with community members who challenge me to expand my ways of thinking, seeing, moving, tasting, hearing, etc. I identify as an artist because the label is constantly in flux, allowing me to define and redefine my role on my own terms. When I say I make art, I mean I am an activator, educator, community builder, maker, performer, connector, lover, etc. AQO: You're known for your intricate cut-paper pieces ranging from portraits to fashion... Please explain your process, and what led to this series. ATB: My intensive paper-cutting process is extremely meditative, providing me the time and space to confront every aspect of myself. The sheets of paper are an archive of every slice and memory, mirroring the intergenerational trauma that so many refugee communities are faced with. Nearly all my pieces are a nonlinear dance between intuitive cutting, drawing/sketching, and calculated slicing. The portraits I create stem from interviews and photographs of the models, while my fashion and installation work are more rooted in memory. I often times view paper as a metaphor for history. When I am working on these hand-cut paper sculptures, I actively carve out space for histories that are actively forgotten and erased in this white supremacist nation. The reductive process deconstructs the white canvas, revealing more and more truths with every slice. For my most recent body of work, yêu em dài lâu (me love you long time), I was thinking about how my cut-paper work could operate as a vehicle for uplifting queer and POC communities. The dynamic, multi-dimensional qualities of my work are made possible by the folx who have trusted me with their portraits. Their experiences, interests, and talents inform the way I sculpt the paper, breathing life into the work. I definitely wouldn't be the artist and human I am today without all the queer, womxn, and POC identifying people who inspire me every day. I'm hoping to learn more about paper-making in order to carve into a more specific surface. The pieces usually take anywhere from 2-4 weeks to complete. It all depends on how much of my life I'm willing to sacrifice for the work, haha. Donrose, 2016, one of five hand-cut paper garments for the MIC/A Benefit Fashion Show, 40"x96"
AQO: Have you collaborated with anyone in the fashion industry? ATB: I have had the honor and privilege of working with Josie Natori on a handful of window displays for NYFW [New York Fashion Week]. David Leung literally found my portfolio on Behance and reached out through email! I am so eternally grateful to him for believing in me and my work. Executing my first window display taught me so much about scale, public art, installation techniques, and negotiating collaborations. I also worked with lululemon lab NYC back in 2017 thanks to my dear friend, Micah McClain. We worked together on a design that emphasized the unique, reflective textile created by the team. Hopefully more opportunities arise in the upcoming years! Slaysian Dynasty, 2016, collaboration with Josie Natori, hand-cut paper installation, 93"x63"
ATB: Wow, I haven't done graphite and charcoal drawing in forever! Those portraits were all made during a time I was still struggling with my gender and sexual identity. They were very cathartic to say the least. I am currently conceptualizing/imagining a brand new body of life-size, graphite and charcoal drawings of POC drag performers. Once Protected, 2011, graphite on paper, 18"x24"
AQO: When you were a child, what artist or artwork made the strongest impression on you? ATB: My mother, Van Bui. She was always the life of the party growing up, bringing people from all walks of life together in conversation and communion. Her ability to piece together an outfit for Sunday mass was/is immaculate. Looking back, I don't know how she gracefully balanced a full-time job, four kids, my father, our extended family, etc. I continue to learn about fashion, interior design, makeup, humility, and communication from observing my mother. When I begin to reflect on the origins of my artistic training, I fondly remember staying up late to finish diorama school projects with her. Incorporating a myriad of materials ranging from paper to toys to glitter, I was obsessed with our ability as humans to transform mundane objects into fantastical dimensions. My mother and I were able to bring histories and narratives to life using a shoe box and hot glue gun! ATB: My brother Joseph-Thanh and I took our first trip to Vietnam at the end of 2017. It was quite influential experiencing a Vietnam that was so drastically different than the refugee stories we heard from our parents growing up. The trip was healing and eye-opening to say the least. Being able to connect with other Vietnamese artists and members of the queer community definitely allowed both of us to reconcile parts of ourselves that once felt so splintered. Our trip wouldn't have been possible without Aiden Nguyen, the co-founder of the Queer Vietnamese Film Festival and Vanguard. Thanks to Aiden, we now have a family of queer Vietnamese folx all over the world! AQO: What's next for you? ATB: I have been fortunate enough to be awarded residencies from Yaddo in Saratoga, NY and The Growlery in San Francisco, CA. During these residencies I will be concentrating on researching Vietnamese-American and LGBTQIA+ history. I'm hopeful that the time, space, and resources provided will allow me to imagine new and innovative performances, public projects, and curatorial ideas. My partner, Brandon Brooks, recently got accepted into Yale's Master of Architecture program as well! I look forward to moving in with him and seeing how 2 years in New Haven will affect my practice. ATB: Hmmmm... once believing this career would be manageable. It isn't. It is so incredibly difficult to sustain an art practice in a society which actively erases and defunds culture. There are still so many injustices within the art world to confront, especially for womxn, femmes, LGBTQIA+ identifying artists, and artists of color. Nonetheless, I am hopeful that we as a community continue to challenge our board members, institutions, and government on a daily basis.